Since it’s March and all, what do you say we prep for St. Patrick’s Day a little early? I’m a big fan of Bailey’s Irish Cream and I’m not letting the fact that I don’t have a drop of Irish blood stop me from finding new excuses to enjoy it. My boyfriend is Irish, so I guess there’s that? The alcohol actually burns off, so you’re left with the delicious flavor and you can leave these in your office kitchen without getting in trouble. 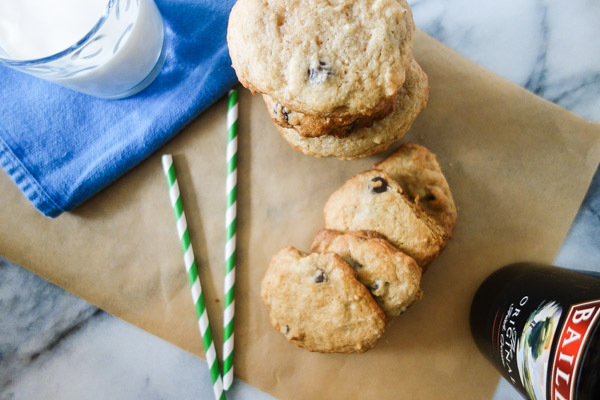 The basic dough for these cookies will be made just like your traditional chocolate chip cookies. Cream the butter and sugars until everything is incorporated together. Add in the eggs, Bailey’s, and vanilla and mix again until smooth. In a small separate bowl, mix the baking powder, baking soda, salt, and flour. 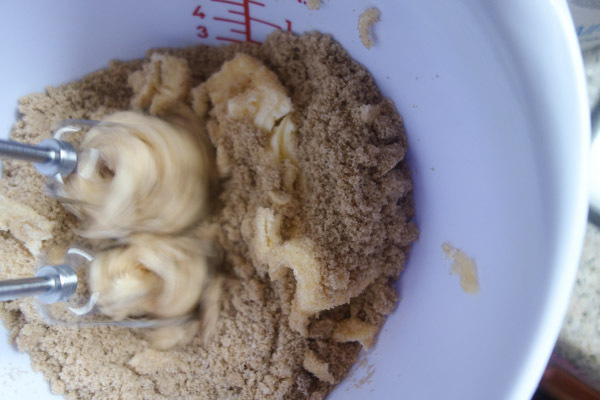 It is easier to make sure the dry ingredients are evenly incorporated when they’ve been mixed together first. Then, you can easily just mix in the flour mixture. Gently stir in the chocolate chips last (don’t use the mixer to do that). You guys. This dough. Try to remember that it contains alcohol if you decide to test it out before baking. I know. Raw eggs. It’s so good though. I had to make sure it was safe to eat. And then my sister helped me test it as well. We went to SoulCycle after our taste testing, which may have been a good or bad idea, so I’ll say we burned it off. You’ve been warned. Spoon the dough evenly onto the baking sheets. I know I’ve raved about the Williams-Sonoma Goldtouch pans before, but they’re seriously great. Cookies slide right off and bake up perfectly. Stick the baking sheets into the fridge or freezer for at least 30 minutes before baking. If you don’t have room for your baking sheets, just form the dough into balls before putting it in the fridge or freezer. Once you’ve chilled the dough, it is harder to scoop the dough into balls. 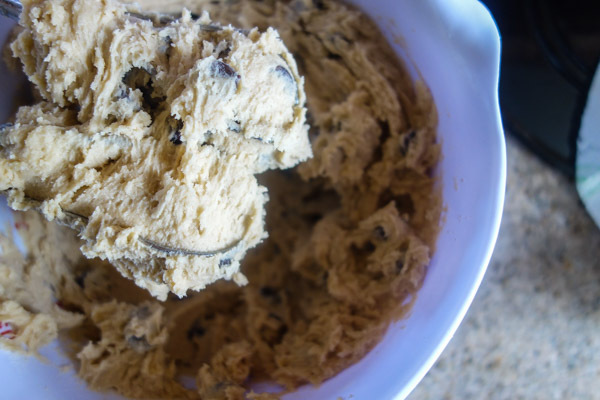 General life tip: if you freeze cookie dough in balls, you can bake the frozen dough whenever you’re craving homemade cookies! When these cookies are done, cool them for a few minutes on a cooling rack. I like my cookies hot out of the oven, but these cookies taste delicious either way. Serve these with a big glass of milk. It is just a hint of Bailey’s flavor, but just enough. 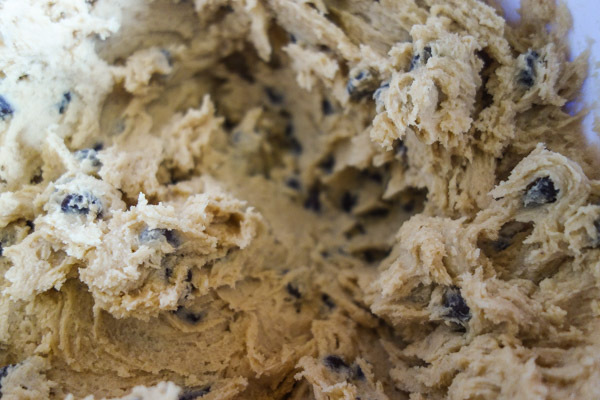 If you want more Bailey’s flavor, you could of course add a little more when making the dough. A little goes a long way, however. Look at this. Melted chocolate chips. 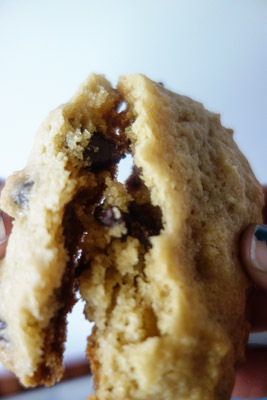 Hot chocolate chip cookies are the best. 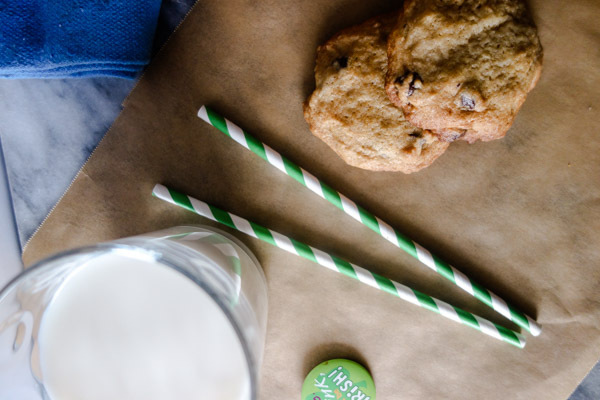 Hope you all try these out for St. Patrick’s Day or whenever you’re looking for a new twist on an old favorite! Cream butter and sugars with handheld mixer or in stand mixer. Add vanilla, eggs, Bailey’s and mix until incorporated. In separate bowl, mix salt, baking powder, baking soda, and flour. Add flour mixture to creamed butter and sugars. Slowly stir in chocolate chips with spoon. Spoon evenly sized scoops of dough onto baking sheet and chill in fridge or freezer for 30 minutes. Preheat oven to 350 degrees when dough is almost ready to bake. Bake cookies for 15-19 minutes. 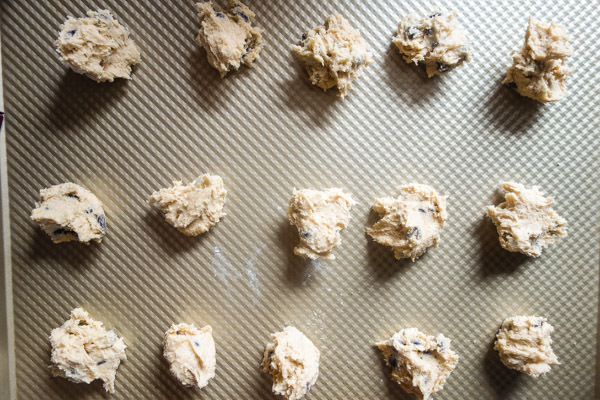 If you froze your dough, you’ll need to bake the cookies for a few minutes longer. Cool cookies on cooling rack for a few minutes before enjoying.